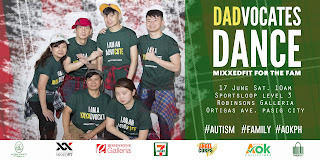 Autism Society Philippines invites Daddies and their families who live with autism to a DADvocates Dance Mixxedfit for the Fam on 17 June 2017, Saturday at 10:00 AM at the Sportsloop Level 3, Robinsons Galleria, Ortigas Ave, Pasig City. MixxedFit is a people-inspired dance fitness program that is a mix of explosive dancing and bootcamp training techniques. Certified Mixxedfit Instructor Miss Donna Lim will lead this innovative dance-fitness incorporates different elements, all of which are designed to tone, strengthen, and increase endurance. MixxedFit will feel you energized, combining fun-loving dance moves with interval training and cardio workouts, individuals will enjoy an inspirational full body workout. It also offers opportunities for parents of children with autism to socialize and meet co-parents. 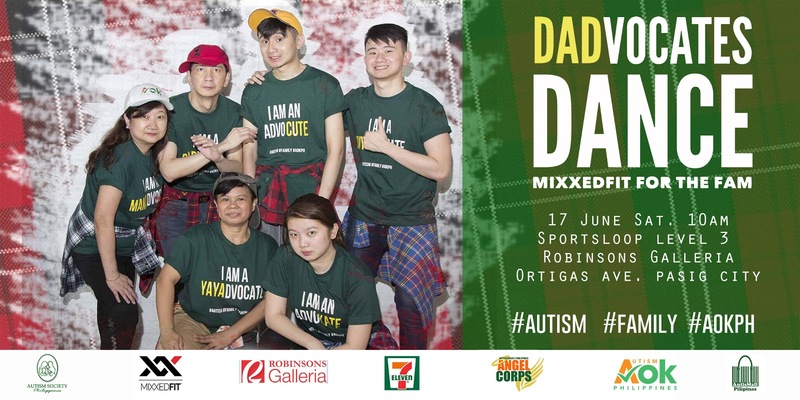 This is open for all parents and family members of children with autism and the individuals with autism. Attendees will wear comfortable workout clothes, such as leggings, workout pants, or shorts, wear appropriate footwear, do NOT wear sandals, flip flops, ballet shoes, hiking boots, or running shoes and bring water and towel.